ORRVILLE, Ohio (June 20, 2016) - After missing the main event on Sunday night at Millstream Speedway, finishing sixth during the evening’s C-main, St. Helena, California’s Rico Abreu made an impressive rebound and nearly swept round four of Ohio Sprint Speedweek presented by Cometic Gasket at Wayne County Speedway in Orrville, Ohio. Abreu earned victories during his respective heat race and dash on Monday evening at Wayne County, all before leading all 30 circuits of the feature program. The $5,000 Ohio Sprint Speedweek presented by Cometic Gasket victory was the fourth Arctic Cat All Star Circuit of Champions win of his career, going back-to-back at Wayne County Speedway in 2016. 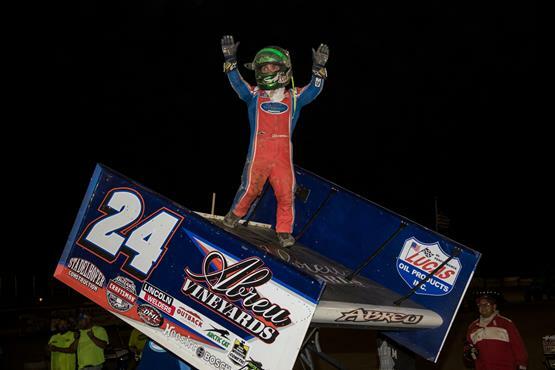 Rico Abreu took command of the feature field immediately after the initial green flag, winning the drag race into turns one and two with Andrew Palker and Jac Haudenschild in tow. The 30-lap main event was halted five times, two of which for red flag conditions during the first five circuits. Despite the frequent cautions, and a needed fuel stop on lap 22, Abreu kept his pace on the point, never feeling pressure from those racing behind him. Kyle Larson, who started third on the feature grid, maintained a top-five running position the entire distance, eventually finishing second at the checkers. Sheldon Haudenschild finished third, followed by fifth row starter Danny Holtgraver and California native Carson Macedo. Night five of the 34th edition of Ohio Sprint Speedweek presented by Cometic Gasket will be contested at the Sharon Speedway in Hartford, Ohio, on Tuesday evening, June 21. Local favorite and defending Arctic Cat All Star Circuit of Champions titlist Dale Blaney is the defending event winner, scoring $5,000 over a pair of Aussie invaders. James McFadden finished second in 2015, followed by Jamie Veal. Sharon Speedway will allow Ohio Sprint Speedweek presented by Cometic Gasket teams to enter the pit area as early as 10:00 am on Tuesday morning, June 21. The Arctic Cat All Star Circuit of Champions drivers meeting will be conducted at 5:30, followed by warm ups and qualifying time trials at 6. For more information, please visit Sharon Speedway live on the Web at www.sharonspeedway.com.